As in 2017, state Senators Regina Birdsell and James Gray were key players in an effort in 2018 to make it harder for college students to vote in New Hampshire. Their measure requiring voters to be established as legal residents of New Hampshire rather than simply domiciled there passed the legislature in House Bill 1264 and, ultimately, was signed into law by Gov. Chris Sununu. The bill effectively levies a poll tax on voters by requiring them to pay fees to register their cars and obtain a New Hampshire driver’s licenses — even if they have other government-issued identification. 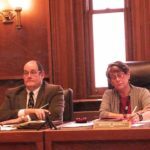 That bill follows Birdsell’s Senate Bill 3, which was signed into law in 2017 and requires New Hampshire voters to prove they are domiciled in the state. That measure has been under legal challenge since it took effect.